South East Fence has a selection of beautiful decorative arbors that are available to rent for weddings or other special events. The cost includes local delivery and setup. Decorations can be added to create more custom wedding arbors, such as silk flowers, garland, lighting and other options that will coordinate with your wedding style or theme. All of our decorative arbors are made from high-quality maintenance-free vinyl, the same long-lasting and durable materials that we use for our custom pergolas and arbors. 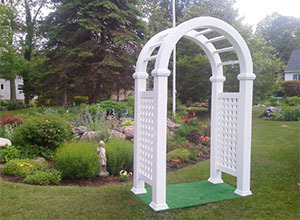 In addition to our standard wedding arbors for rent, we also have custom wedding arbors that can be designed and purchased according to your unique specifications. Contact South East Fence at 508-947-4063 to find out more about our maintenance-free vinyl custom wedding arbors and decorative arbors for rent, as well as our other custom fence work options that can be used for your wedding or special event. Our team can answer all of your questions about any of our maintenance-free vinyl products and custom services. Contact us to reserve your arbor today!